The last lock of the entire river system! How bittersweet. 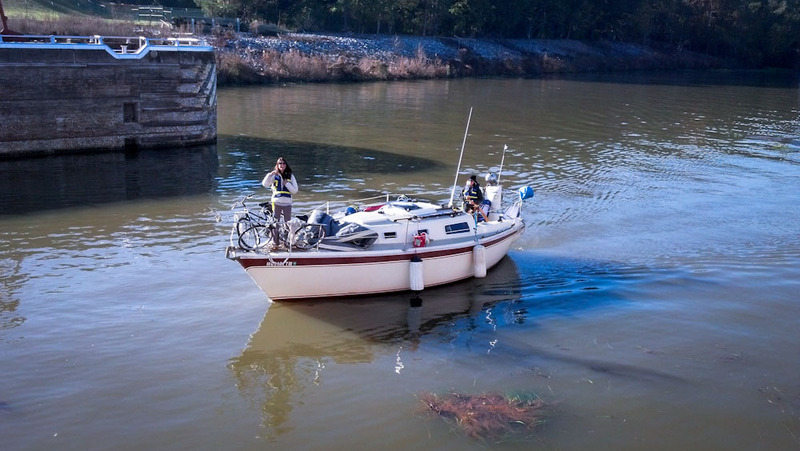 Coffeeville Lock, just after Bobby’s Fish Camp…. we loved this one so much that we decided to lock down… stay in the lock…and lock right back up. After traveling for several days by ourselves, we got a call from our fellow sailor friends “Whish” as we were on our way down the lock. Donna, on Whish informed us they would catch up to us if we stayed put for a day (not knowing we had already moved forward.) Considering it was Halloween, and we didn’t feel like celebrating with just each other, boooring – we contacted the lock master and asked if we could stay on the floating bollard and lock back up. He laughed and told us we were the first people he has ever seen to do such a thing. By the time the chamber filled back up we were dressed as pirates, with “Pirates of the Caribbean” blasting from the speakers. Coffeeville Employees looked concerned. Locking down what we thought would be our last. 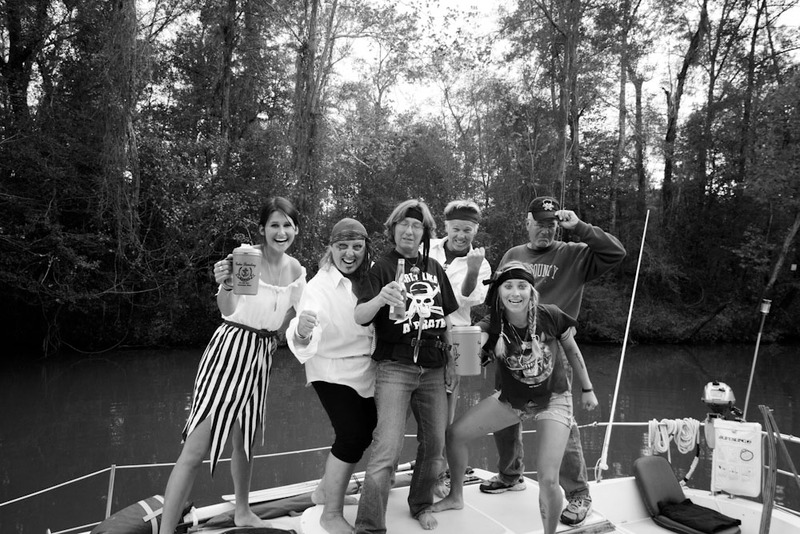 Moments before we transformed into pirates, and turned around to backtrack 5 miles upriver to meet with Whish and Truant. Intimidating. I know. 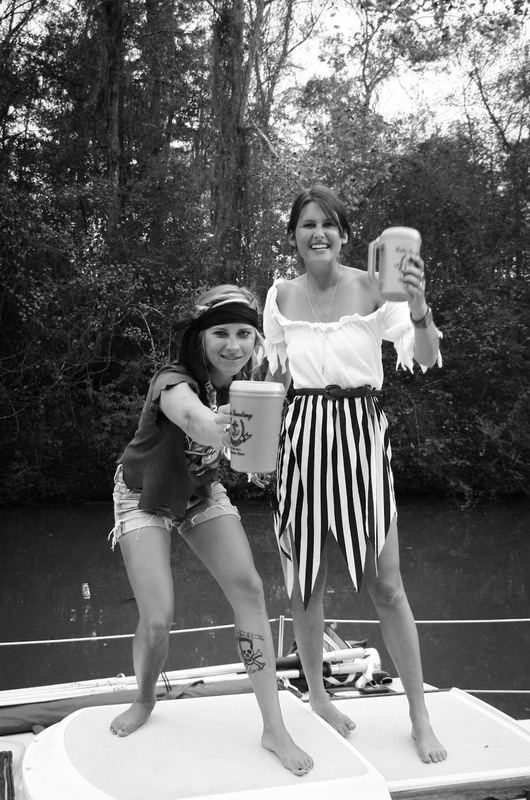 Pirate day. Since Pickwick Lake we have been traveling with Donna and Jeff aboard SV Whish, and Mark and Jo aboard SV Truant. 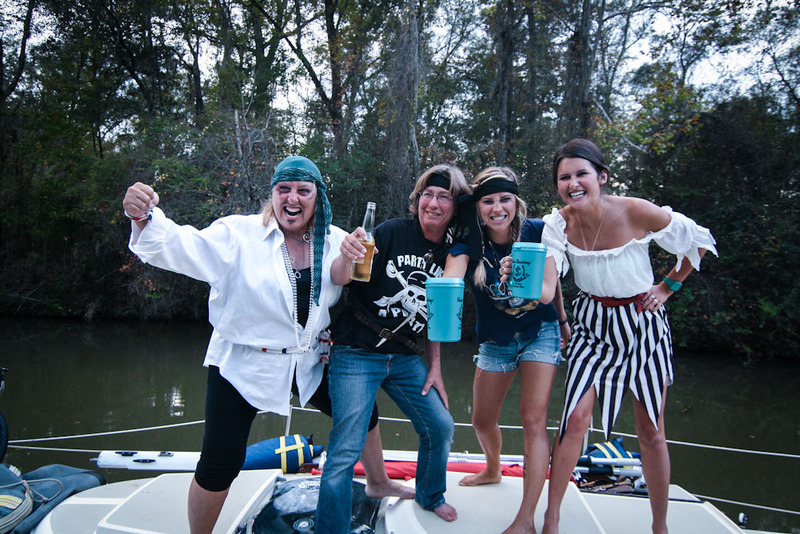 We agreed previous to Halloween that we would have a “pirate day” if we were all together. Pirates we were. The six of us ate and drank and talked absolute non-sense all evening. The party ended at 8:30 because pirates go to sleep early. Or have too much to drink. The ladies. Love you ladies. Thank you Hinnerk Weiler for bringing us together. 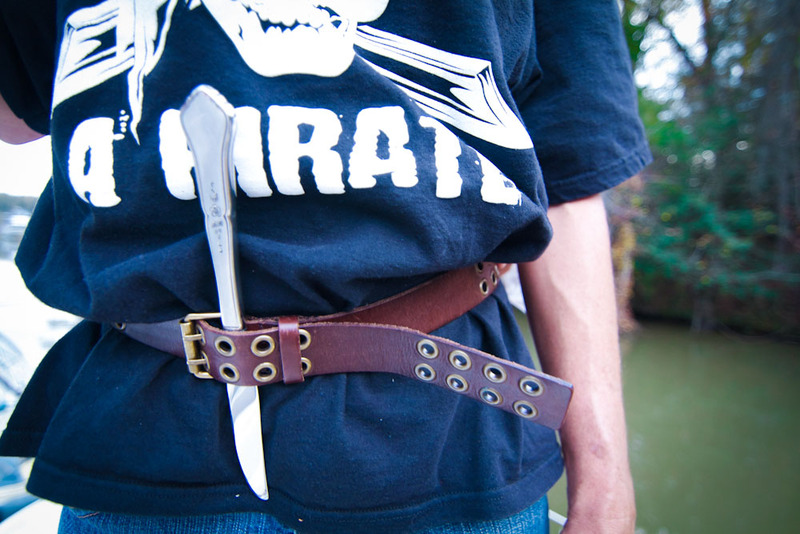 Pirates have butter knives in their belts. 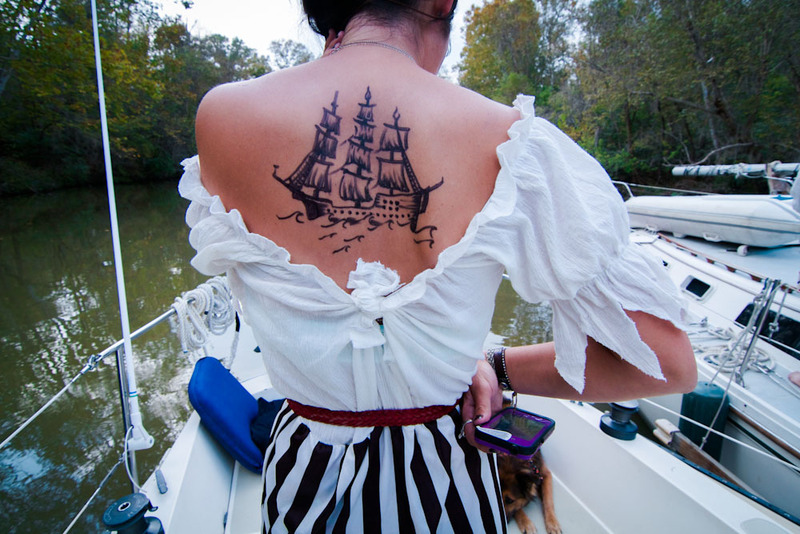 Pirates also have ships tattooed on their backs. This ended up being one of the best and most memorable days while traveling the rivers. Katie and I both get anxious to move on, always wanting to get to the next place. Just backtracking 5 miles, and the thought of going back up river was for some reason unbearable. Closer to Michigan?!? No thank you. The moment we decided not to be lame for the holiday and to postpone our next stop just a single day, it ended up being the greatest move yet. I love pirates.